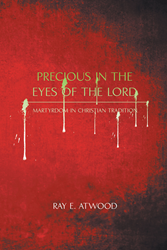 Recent release “Precious in the Eyes of the Lord: Martyrdom in Christian Tradition” from Page Publishing author Ray E. Atwood is a profound narrative that talks about the commendable lives of martyrs around the world since the ancient times, from the biblical Abel to the twentieth century Acteal Martyrs of Mexico. Ray E. Atwood, a Catholic priest of the Archdiocese of Dubuque, Iowa, a master of divinity degree, master of arts degree in systematic theology, as well as having a bachelor of arts degree in journalism/mass communication, has completed his new book “Precious in the Eyes of the Lord: Martyrdom in Christian Tradition”: a comprehensive work on the lives and deaths of martyrs throughout the ages since the dawn of theistic faith and belief. Published by New York City-based Page Publishing, Ray E. Atwood’s enriching narrative emphasizes the last moments of the saints as they offered their lives as living sacrifices for the glory of God and to spread the good news of salvation – a memorable life filled with bountiful virtues, compassion, fortitude, and patriotism. Readers who wish to experience this powerful magnum opus can purchase “Precious in the Eyes of the Lord: Martyrdom in Christian Tradition” at bookstores everywhere, or online at the Apple iTunes store, Amazon, Google Play, Kobo, or Barnes and Noble. For additional information or media inquiries, contact Page Publishing at 866-315-2708. Page Publishing is a traditional New York based full-service publishing house that handles all of the intricacies involved in publishing its authors’ books, including distribution in the world’s largest retail outlets and royalty generation. Page Publishing knows that authors need to be free to create - not bogged down with complicated business issues like eBook conversion, establishing wholesale accounts, insurance, shipping, taxes and the like. Its roster of authors can leave behind these tedious, complex and time consuming issues, and focus on their passion: writing and creating. Learn more at http://www.pagepublishing.com.